Utilizing the power of methylene chloride, Piranha 2 attacks multiple layers of paint in a single application to remove most oil and latex paints, varnishes, shellacs, lacquers and enamels. The powerful paint remover does not require anti-evaporation paper like many caustics or other weaker solvent formulas. For indoor application, open all windows and doors or use other means to assure a constant supply of fresh moving air during use. Do not use Piranha 2 in poorly ventilated areas. Ideal working temperature is between 65°- 85°F. Avoid direct sunlight. Protect floor coverings and other areas not being stripped. Do not use on synthetic fabrics, plastic, linoleum, asphalt, foam products or rubber tile. Apply Piranha 2 with brush or airless spray equipment. Stir well before using. Open pail carefully to avoid splashing. For best results, test a small area to determine the appropriate thickness, and duration of time required to most effectively remove the lead-based paint. Brush on a thick layer in one direction for best results. Brushing back and forth opens up the anti-evaporation barrier, which forms on the initial pass. 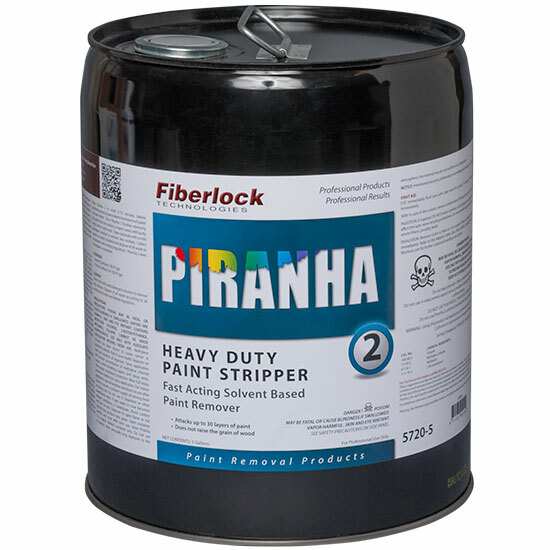 Allow Piranha 2 to work 5-15 minutes before performing a test scrape to determine how much paint has been lifted. Once Piranha 2 finishes removing the paint from the surface, scrape it away with putty knife, cloth or steel wool. Clean substrate with a mild detergent solution to remove any residues. Collect waste in a metal container and dispose of all waste in accordance with existing regulations. Piranha 2 does not require a neutralizer. Clean tools with a mild detergent solution to remove any residues. Dispose of all waste according to all existing local, state and federal regulations.